Systematic attention and experience are our companions in the Health & Pharmaceutical sector, through which we safely transport products with diverse specifications. 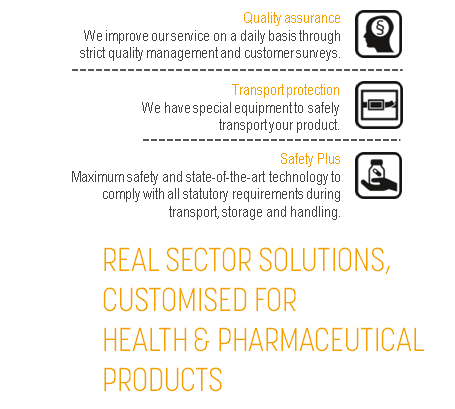 We transport and store packaged products, raw materials and devices of the health sector. The diverse spectrum includes, for instance, temperature-sensitive drugs and packaged semi-finished products in the form of granulates. They all require specific procedures for transport and storage with regard to temperature management or air conditioning. Highly sensitive medical devices are transported by us using specifically spring-suspended semi-trailers. With these services, we abide by the statutory guidelines and country-specific requirements. Our quality management system and the application of industry standards are also used at our company.